Watford Football Club have announced a new kit deal with Joma for the 2009 / 2010 season, but while the kit has been designed, the colours have yet to be chosen. 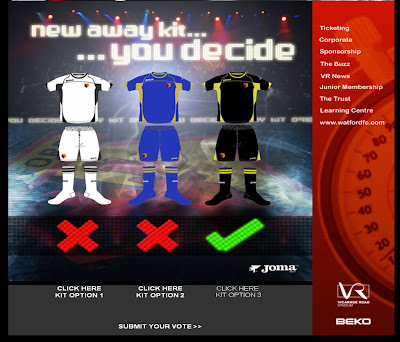 Watford have offered their fans the chance to vote for the 2009 / 2010 kit colours and have emailed their fan base to inform them of this opportunity. 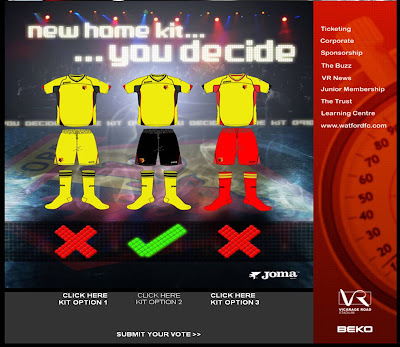 The choices will also be on the official Watford website shortly, voting will close at 5pm on 5th February and the winning designs will be announced at the end of the season. Specsavers tactical Watford ad for the goal that never was!